Cobalt vs Titanium Drill Bits: Which is Best? Not all drill bits are made the same. If you’re looking to do tougher projects than your standard bits can handle, you may be looking online for something that better suits your needs. And it can be hard to find the right type of bit for your next project. Misleading product descriptions that read more like ad copy than honest facts. We think that it shouldn’t be that way and that a well-informed consumer can find the bits that are right for them if they’re given all the information they need. That’s why we’ve created this comparison of cobalt and titanium drill bits. When you’re done with this guide, you will know what makes each kind special, and when you should be using them. Cobalt drill bits are more than just steel with a layer of something tougher poured across the top. These bits are made primarily from high-speed steel but feature between five and eight percent cobalt in the mixture. That means they’re far more durable than standard bits and win out over regular high-speed steel bits. If you need to drill very hard materials that would quickly wear down other drill bits, then this should be your go-to bit. Cobalt bits work great for treated stainless steel, cast iron, and they even work on titanium. These bits are very heat resistant, which is great considering the heat that builds up while you’re drilling into metal, even when you’re using lubricants. Since they’re so tough, manufacturers can often achieve the same drilling effectiveness with smaller flutes, which has two primary benefits. The first is that the bit is overall stronger and less likely to snap since less material is removed. The second is that you can sharpen these bits if they get dull. Since the cobalt isn’t a coating but is instead evenly found throughout the steel, each layer is just as effective as the first one when properly sharpened. The primary downside to cobalt drill bits is that they’re very expensive. They’re great bits, but what keeps them from being a good general-purpose bit is the fact that you don’t want to wear them down enough that you have to replace them regularly. That would get very pricey, very fast. These bits work just fine on wood and softer metal, but you’ll probably want to keep a cheaper bit around for these tasks. The strength and durability a cobalt drill bit provides is overkill when it comes to these projects. When it comes to getting good value, you won’t be able just to check a cobalt drill bit when you’re done. You’ll need to sharpen it a few times before you retire it if you want to get the best bang for your buck. If the price were lower, then this wouldn’t be as much of an issue, but since you’re paying a premium for these bits, you’ll want to have them last as long as possible. There are a lot of good home drill bit sharpening kits on the market today. If you don’t already own one, it’s a good idea to invest in one before you spend money on a cobalt drill bit. Titanium drill bits are misleadingly-named. The core of each drill bit is made from high-speed steel, and the exterior is coated with a layer with Titanium-Nitride. If you’re shopping for those bits online, you may see Titanium-Nitride abbreviated as TiN. The nice thing about these drill bits is that they have a relatively low cost. 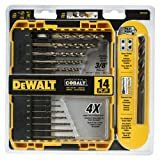 They’re great for working on wood, softer metals such as magnesium and aluminum, and even plastic if you really feel like you need the extra power. As mentioned previously, TiN is a coating layered over high-speed steel. While you may think that the coating would be designed to make a sharper edge or create a stronger surface, this coating does something else. TiN coatings reduce friction while drilling. Reduced friction leads to lower overall heat, and since heat is a major factor in the degradation of drill bits, it means they last far longer. Compared to regular high-speed steel bits, TiN-coated drill bits tend to last between three and six times as long, which means you’re getting great bang for your buck when you buy these bits, as they’re not too much more expensive than regular high-speed steel. While the coating lasts, these bits are harder than the cobalt ones, making them one of the toughest on the market. The big downside to titanium drill bits is that they’re only special for as long as their coating lasts. Once the coating has worn off, there’s only high-speed steel left underneath. While high-speed steel is a decent cutting material, the extra heat generated when it makes contact with the material you’re cutting will lead it to wear down far more quickly. At that point, it’s not any better than a bare high-speed steel bit. That means that once these bits get dull, there’s no way to bring them back from the brink. You can’t sharpen them, as that would wear away at what remains of the TiN coating and destroy the bit. And, there’s no way to reapply the coating yourself at home. That means that relative to cobalt bits, titanium bits should be thought of as being far more disposable. Once the coating is worn down, replace it with a fresh bit, as its best days are over. These bits don’t do well with harder metals such as stainless steel or cast iron because those harder metals will quickly strip the coating off the bit. If you needed to do just a few holes in those materials, you could get away with it, but if you were going to be drilling into those materials all day, you’d burn through titanium drill bits at a very high rate relative to cobalt bits. 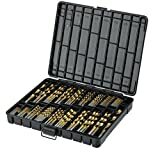 Are drill guides actually worth buying? Or just a gadget you’ll never end up using? How do you sharpen your drill bits? Which drill bit is right for you depends on what materials you’re going to be drilling in the near future. If you’re going to be working exclusively with harder metals, like stainless steel and cast iron, then you’ll be better off with a cobalt bit due to its superior durability and the ability to sharpen the bit. If you’re going to be working with softer metals and wood, then you can’t go wrong with a titanium drill bit. If you’re looking towards longevity, you’ll be better off getting a cobalt drill bit, since you can sharpen it multiple times before it becomes too thin or finally breaks, though you should keep in mind that the price of a bit sharpener drives up the overall price. However, if you can buy titanium drill buts for a far lower price, so if a low price is what’s most important to you, then the titanium drill bits will serve you better. While this might sound complicated, the most important thing to remember is that if you match the bit, you buy to the projects you’re doing, you’ll get the bit you need at a great price.